We know that releasing your dog to any rescue organization is painful to contemplate. Here is a little information about our Rescue to help you decide if we're a good option for you. 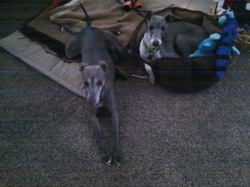 We are the official rescue of the Italian Greyhound Club of America in the Pacific Northwest. We foster all the dogs that come to us in private homes where they live as part of the foster family. We have all dogs checked by a veterinarian and (if needed) bring them up to date on vaccinations, spay or neuter, dentals, and address major medical problems. We assess each dog for a minimum of two weeks, usually longer, so we can make a good match between the dog and the new home. We foster all dogs until we find the right match—and we are all pretty compulsive about finding that right match. Our adoption process is pretty stringent, so we find a great match for our Rescue dogs. Post-adoption, we make follow-up visits and calls to ensure that the dog is happily settled. All adopters agree to return the dog to us should it ever happen that they cannot keep the dog. Thank you so much for thinking of releasing your dog to us. You should hear back from us in less than 24 hours. Please tell us the best time of day to reach you by phone. Please tell us where you live (city and state).